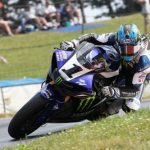 This weekend, Josh Herrin is racing both his normal MotoAmerica Superbike class as well as in the WorldSBK Championship as a Wild Card entry at Laguna Seca. In doing so, Josh will join an exclusive group of road-racing legends. Go Josh! Give ’em hell! When Attack Performance/Herrin Compound Superbike rider Josh Herrin competes at WeatherTech Raceway Laguna Seca next weekend, he’ll join a special group of motorcycle road racers who have competed as Wild Card entrants at World Superbike races held in the U.S.
Josh Herrin joins an elite list of legends that includes MotoAmerica race director Doug Chandler and rider representative Thomas Stevens, Scott Russell, Miguel Duhamel, Freddie Spencer, Mat Mladin, Anthony Gobert, Ben and Eric Bostrom, Nicky and Roger Hayden, Aaron Yates, beIN Sports race broadcast commentator Jason Pridmore, M4 ECSTAR Suzuki team principal Chris Ulrich, and others. 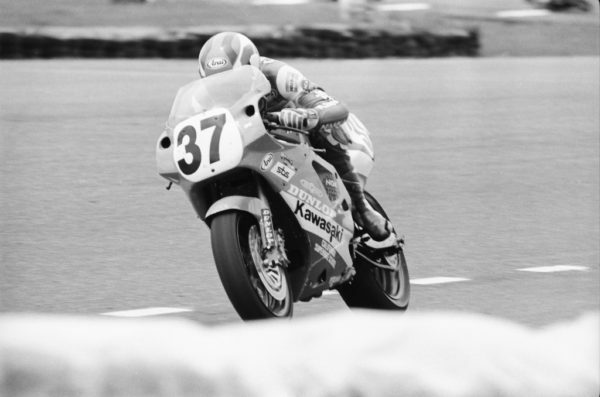 Doug Chandler won race two in the World Superbike round at Brainerd International Raceway in 1990. 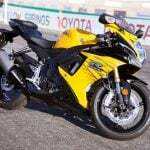 Wild Card entrants have been part of the U.S. rounds of the Superbike World Championship almost since the beginning. In fact, during WSBK’s second-ever visit to America soil – at Minnesota’s Brainerd International Raceway in 1990 – Doug Chandler put his Muzzy Kawasaki ZX-7 Superbike on the pole and very nearly won race one with a three-second lead until he suffered a mechanical problem. He came back to win race two. In 1995, Smokin’ Joe’s Honda riders Miguel Duhamel and Mike Hale both scored podium finishes as World Superbike Wild Card entrants at Laguna Seca. 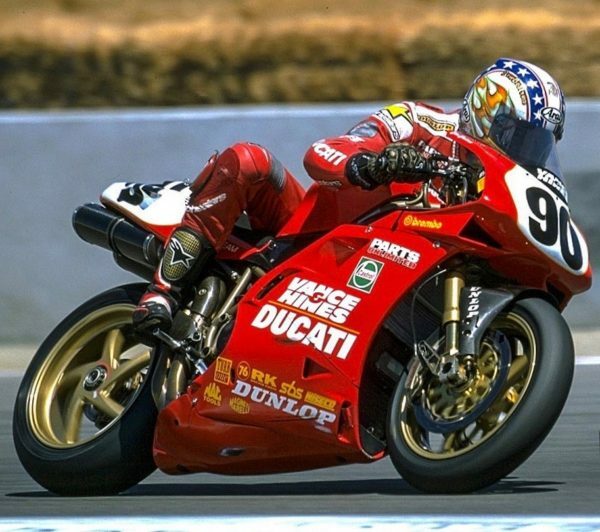 And then, in 1999, Vance & Hines Ducati teammates Anthony Gobert and Ben Bostrom each won a World Superbike race apiece as Wild Cards at Laguna Seca. 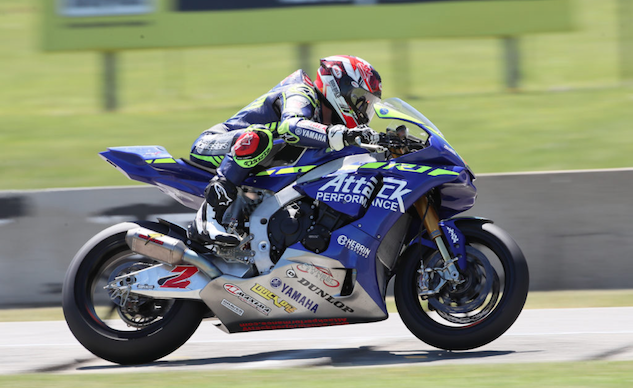 Unlike next weekend’s combined MotoAmerica/World Superbike event at WeatherTech Raceway Laguna Seca, though, AMA-sanctioned road racing and WSBK haven’t always shared a round in the U.S. 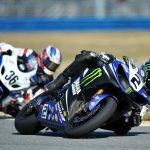 In fact, none of the Wild Card riders who has won a World Superbike race on U.S. soil also competed in AMA Superbike races during the same weekend that they notched their WSBK victories. Next weekend, Herrin and his Attack Performance/Herrin Compound squad are going to attempt something truly unusual. 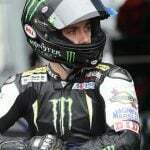 Herrin intends to compete in both MotoAmerica Superbike races, as well as both Superbike World Championship races. Ben Bostrom also had success as a Wild Card in World Superbike, splitting wins at Laguna with teammate Anthony Gobert in 1999. Actually, not only has it been attempted before, but it’s also been accomplished, and then some. In 2008, at Miller Motorsports Park (now called Utah Motorsports Campus), Scott Jensen – who is now crew chief for Genuine Broaster Chicken Honda – competed in both AMA Pro Racing Superbike races and both Superbike World Championship races. 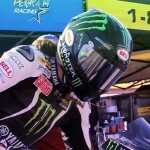 Oh, and he also competed in the Superstock 1000 race that was on the schedule that weekend, too. Yes, we’re counting, Scottie, and you own the record.